gastric lumen, with flecks of white mucoid debris throughout, which prevented good viewing of the gastric mucosa in three individuals (SB 387, 522 and 530). In each of these cases, there was also an ingesta mass in the pyloric antrum that prevented observations and penetrating the pyloric with the endoscope. Each of these pandas had undergone minimal fasting and water removal before anaesthesia, which apparently contributed to this difficulty. No technical challenges occurred in the remaining animals where evaluations were completed for the greater and lesser curvatures of the stomach, reflex evaluation of the cardia and assessment of the pyloric antrum. The gastric mucosa appeared moderately pink and had a smooth texture. 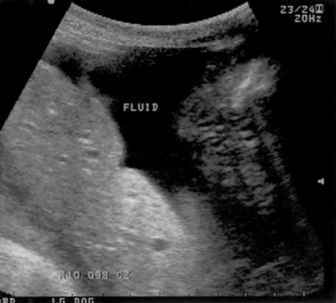 Large vessels were visible in the submucosa, rugal folds were distinctive and oriented in a direction leading to the pyloric antrum, and moderate to marked peristalsis was evident. Multiple regional (cardiac, body, antral) gastric biopsies were taken (with minimal bleeding) in all pandas, except SB 575 which was not sampled because of young age (nine months old). evident. 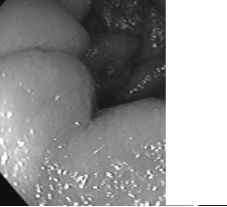 Pinch biopsies were obtained adjacent to the ulcer with no increased bleeding as compared to grossly normal gastric tissue. Another giant panda (SB 515) had small fragments of foreign material evident in the gastric lumen, whereas another (SB 387) had a single polypoid mucosal mass in the pyloric antrum, which was also biopsied. 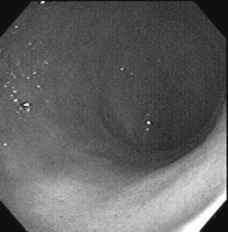 peristalsis was generally evident, which obscured the lumen for short periods (of about three to five seconds). 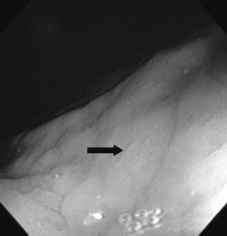 Numerous pinch biopsies were taken at various points within the length of the duodenum, resulting in negligible haemorrhage. Duodenal biopsies were mucoid and friable as compared to similarly sized samples collected from stomach tissue. When entry into the pylorus was prevented by residual ingesta (SB 387, 522 and 530) or by panda size or age (SB 342 and 454), blind biopsies were made successfully in the duodenum. 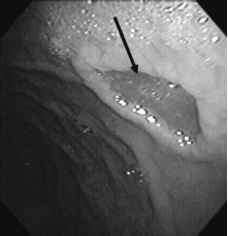 This was accomplished by passing the pinch biopsy forceps through the pylorus into the duodenum, proceeding until mild resistance was met (indicating mucosal contact) and then taking a biopsy from that location. 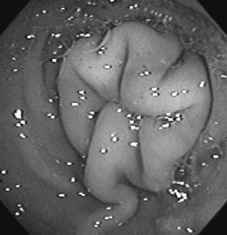 On two occasions, it was possible to pass the endoscope into the duodenum over the inserted biopsy instrument (using the instrument as a guide). One panda (SB 297) exhibited patchy areas of thick-appearing, pale mucosa in the duodenum, which was highly friable at biopsy as compared to counterpart pandas (Fig. 18.11; Plate XXXVII). 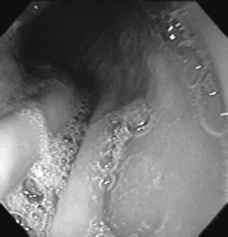 of the descending colon which resulted in minimal bleeding. Inspection for erythema, erosions, ulcerations and strictures revealed only one abnormal incidence. The colonic mucosa in giant panda SB 297 appeared erythemic in coloration and had an even coarser texture than counterpart individuals.